You thought it was just the Monkees? I’ll get to the Monkees in a minute. RT presents an interesting chronology of events that led up to that fire. Judge for yourself. From my vantage point, it helps to remember that the Americans are very good at agitation by use of media and professional agents provocateur. Some of the most memorable battles in our history involved people sent in to stir up violence to justify a police response. Two such events in my lifetime were at the Chicago Democratic convention in 1968, where a police riot was depicted as rioting kids, and the so-called Battle in Seattle in 1999, where a peaceful demonstration against the WTO become a bloody confrontation due to agents provocateur. So much of what became media spectacle in our past was put there on purpose, to keep public opinion under control. I don’t think that Kiev set out to create the Odessa fire, but that is certainly the source of the agitation that led to the event (which it is now blaming on the victims). This sort of naturally leads to the staged events of the 1960’s, and how visual spectacles are used to control public opinion. James McGowan has a new book out, Weird Scenes Inside the Canyon: Laurel Canyon, Covert Ops & the Dark Heart of the Hippy Dream that is nothing short of fascinating. He stumbled on some odd features of the musicians that became famous in the late 1960’s and who lived in or near Laurel Canyon in Los Angeles. For one, an inordinate number of players, from Jim Morrison to David Crosby to Stephen Stills, John Phillips and Cass Elliot to many, many others, are the product of parents with military intelligence backgrounds. If they were just military brats, that could be called coincidence, but Jim Morrison’s dad, for example, was Intel and commanded the ship that caused the Gulf of Tonkin incident. This extends to those on the periphery, Joan Baez, Jane Fonda (Hank came from military intel), Jackson Browne – overwhelming coincidence in such common backgrounds, and then at once for all of them to move to the Canyon where sat at the time a large CIA facility used for photographic development and movie making. The thrust of McGowan’s thesis, which is really evidence-based speculation, is that the people in question were tools, not even that talented, and were part of an intelligence effort to divert and discredit the real anti-Vietnam War movement by associating it with hippies and drugs. The early days of the anti-war movement was a collection of serious young people on campuses sitting behind tables and holding teach-ins to tell the other side of the American invasion of Vietnam. Some evidence to support this comes from the true musical geniuses behind the popular music of that era, The Wrecking Crew, an informal group of studio musicians who made the real sounds behind the Byrds, Buffalo Springfield, the Beach Boys and Doors and so many others. The Crew made the music palatable. Glen Campbell was the guitar on Beach Boys’ Fun, Fun, Fun, for example, while Carol Kaye did the walking bass line on Good Vibrations and Hal Blaine was the drums behind America’s Sister Golden Hair. Very little of the music coming out of Los Angeles during that time was really done by the groups to whom it was credited. The Byrds, Beach Boys (Brian Wilson was a true musical genius) and others put on some truly crappy concerts during that time, but it didn’t matter. The kids in attendance were not hearing that. They were hearing the Wrecking Crew. That is the power of suggestion. 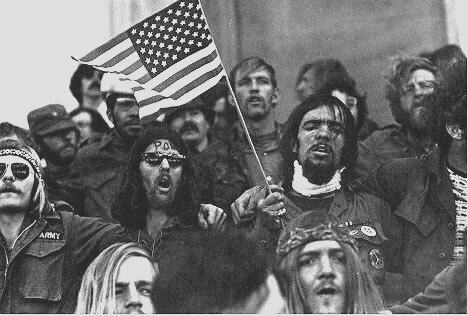 In the end, the bulk of American public associated the anti-Vietnam War movement with hippies and drugs. That was the intent and purpose of the assemblage of so-so talent at Laurel Canyon – to create that image, which took hold by power of suggestion and injection of weird hair and dress into the LA music scene. 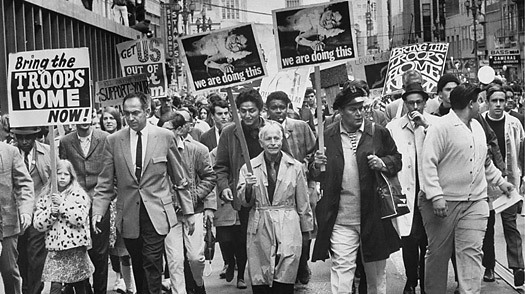 After that time, the news media was never short of images to distort the message, a practice used to this day to discredit left-wing protesters of any cause. The lesson: Much of what we see and hear in popular culture and news is planted, and most of what we think is suggested to us through our news and entertainment media. We rarely think our own thoughts. As we see the news unfolding in Ukraine, I see the Americans at work, as our people are expert at disruption and agitprop, and staged events using agents provocateur is one of our specialties. What they want there, why they are doing it … Moon of Alabama is my best counter-propaganda source. Voltaire Network is another. These sources aside America news does yield better balance. Robert Parry at ConsortiumNews is a must read, also. He was one of the investigative journalists that got started by breaking a bunch of Iran-Contra stories in the 80s. He’s been following the U.S. propaganda efforts, and offering up what he sees at the competing Official Washington narrative vs. a narrative based on ascertainable facts. Of course what is “ascertainable” as you’ve referenced above, can also be suspect. Hence a good investigative journalist is always suspect, and Parry understands that. It’s a hall of mirrors, with planted leaders and ideas to lead us down garden paths. Just with 9/11 they’ve given us a dozen ways to find out what didn’t happen, from Jones and his nanothermites and Gage and Lear to Fetzer and “mini nukes” that most likely don’t even exist. If you are skeptical of official truth, you’ve got to be even more wary of planted false leads at every turn. We can squeeze what is probably true out of all of that, but always after the fact, way too late. I wonder if the public was ever smarter than now, and tend to believe that before popular culture and news became so all-embracing, there had to be more intelligence out there. The human brain, left to its own, is a powerful tool, but is so suggestible that it seems easily neutralized.